On Saturday night, Tony Stewart did what he so often does. He competed in a Sprint Cup race. But according to the Ontario County Sheriff’s Department, Stewart struck and killed a fellow driver at Canandaigua (N.Y.) Motorsports Park. It shows Stewart’s #14 car nudge driver Kevin Ward Jr.’s car into the wall shortly after going around a turn. Ward gets out of his car and walks down into the middle of the track to confront Stewart while the cars were still driving under caution. From ESPN.com: “Ontario County Sheriff Philip Povero said his department’s investigation is not criminal and that Stewart was “fully cooperative” and appeared “very upset” over what had happened. “He was visibly shaken by this accident,” Povero said. Stewart-Haas Racing, of which Stewart is a co-owner, released a statement early Sunday morning. This is a complete tragedy and our thoughts and prayers go out to the Ward family. 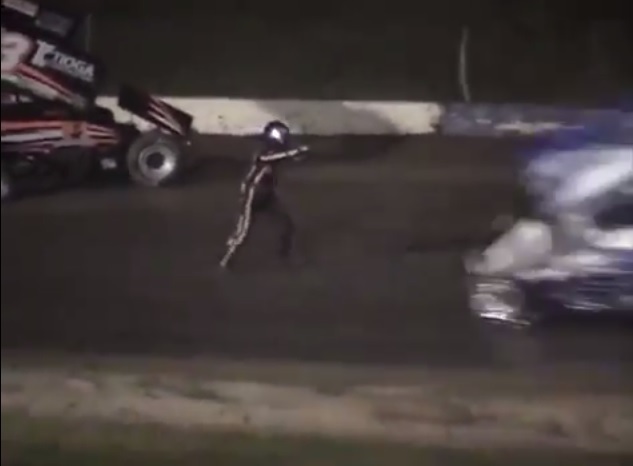 Unfortunately, no matter who was at fault here, this will go down as another black eye on Tony Stewart and NASCAR. Stewart is scheduled to drive today at Watkins Glen. UPDATE: Regan Smith has been called in to take Tony Stewart’s place in today’s race at Watkins Glen. H/T to @Zprophet_MMA for the Youtube video.